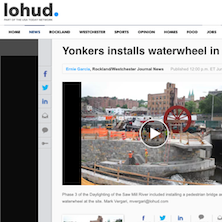 YONKERS – A new downtown park added a large waterwheel and pedestrian bridge on Wednesday. Construction workers were busy Wednesday morning preparing the large waterwheel’s mooring in a concrete channel next to the Saw Mill River at New Main Street. The installation is the latest milestone for the third phase of a plan to transform parts of the previously covered Saw Mill River into parks. It is expected to be finished by the fall, according to Andrew Grundy, a senior project manager at PS&S. “The remaining work after the waterwheel and the bridge go in is going to be … concrete curbing, sidewalks within the park, pavers within the park and then landscaping,” said Grundy.